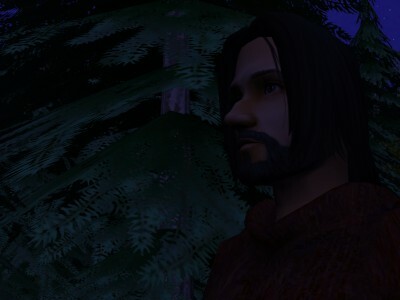 Egelric hurried up through the woods towards the downs, and as he went he whipped viciously at the naked bushes with a length of twine that he had picked up along the way. He was going to see the redhead, and the old man be damned. She was the only one he thought bold enough to hold her own against him tonight. 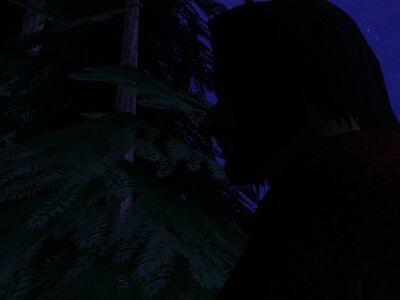 The trees began to thin, and now he climbed towards the dim blue light of the open sky. He began to see shadows that lay more heavily over the shadow that surrounded him, cast by a moon that was waxing full. Suddenly Egelric tossed his twine aside and drew his knife. Something large had just gone bounding past on a path parallel to his own. It was not the galumphing of a bear, and it seemed to leap more than a wolf or wild dog would do – those were his two great fears. Nor did he think a man could move so rapidly. It was almost certainly a deer. It would be something to bring down a deer with his knife, and it might do him some good to kill it, but he knew the animals too wary to be taken so easily, so he sheathed his blade and walked on. He had only walked a few more steps before he whipped it out again. A tall form had come to blank out the patch of starry sky towards which he had been walking. “I go home,” she said eagerly. “I talk you! Good mornin’!” She lifted the hem of her skirt and bent in a graceful movement that made a rather awkward curtsey for all that. “How to you day?” Then she stood on her tiptoes and shook her little fists in excitement, pink with pride. Egelric threw back his head and laughed. He could not help it – she was no more than a child. “Good evernin’,” she repeated, looking up. “Evenin’,” she repeated to the sky. “I see you!” She looked at him and laughed. “Good evening, Sela,” he said, bowing. “Good evernin’, Egelric,” she giggled and bowed. “What you call… dis?” she asked as her hand darted out to take his. “I see your hand,” he corrected. Indeed she was closely watching his mouth as he spoke, but he could see that he had quite lost her with this last. 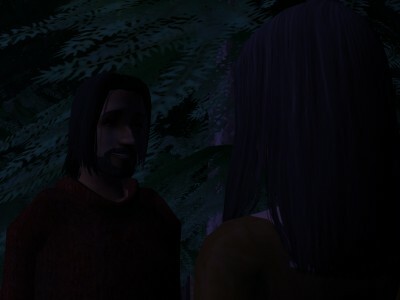 “Look.” He dropped her hand and bent to pick up a handful of pine needles. “Hold,” he said, bringing them up before her face. “Drop.” He let them fall. He broke a twig from a tree and held it up to her. “Hold,” he said, and “drop,” as he let it fall. She watched him closely, like a child, silently mouthing the words as he went. “Hold,” he said of a bit of branch, and “Drop” again. “No,” he laughed. “That’s throw. Watch.” He took a twig in each hand and dropped one and threw the other as he spoke the words to demonstrate the difference. “Drop,” she repeated solemnly with a handful of needles, and “Trow!” she giggled as another handful rained down on their heads. “I trow you!” she threatened with a dazzling smile. She squinted her eyes in determination and put the tip of her tongue between her teeth, but she produced more spit than sound. She clapped her hand over her mouth for an instant, but then she began to laugh so heartily that he was carried away with her, and he laughed until tears gathered in the corners of his eyes. “No trow, no trow, I drop you,” she said after they had caught their breath, which only set them off laughing again. “God pless you,” she repeated. She smiled expectantly at him. Her smile grew softer as he spoke, as if she understood more than what was in his words. Then she began to speak to him in her own language, and though he could understand none of it, he thought he caught such compassion and wisdom in her voice and in her dark eyes that he was suddenly mortified. She was no child, and neither had she the mind of a child. “Please go home,” he whispered to the face she held too close to his. “Please tank you welcome,” she whispered in reply. “Please go home,” he repeated miserably. He smiled sorrowfully at her, and she dipped into a bow and then bounded off like a hare. He trudged up the hill, picking pine needles off of his neck as he went. He was sorry she had come, and sorry she had gone. He had felt like a boy for a moment with her, but he did not think he would be so easily fooled the next time. The next time? He would have to hope there wouldn’t be a next time. But he would go home. He no longer cared to see that vicious redhead tonight. I think the elf girl is good for him. She's briefly giving him happiness here and there. It would be great if humans and elves got along and could live harmoniously. I've said it before, but I would like to see these two together. The elf girl seems to be the only one capable of getting him out of his despondency. I like her, because Egelric is being an idiot. 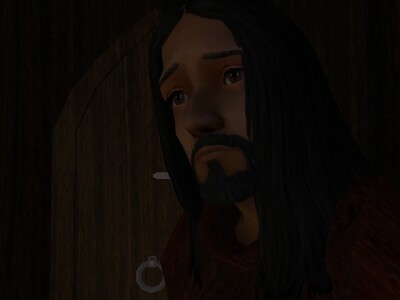 Iylaine misses him terribly, he barely sees Gunnilda . . . I really like Sela. She may be like a child in a world of men, but she is surely something more in her own world. I hope she will help Egelric to be like he used to, I miss the old Egelric... and I don't like the one he's now becoming. quoting from Rowena ", but she is surely something more in her own world." How true Rowena. Ooooh... nice catch, Devin. I'll pretend I meant to do that. I wonder what she said to him. OMG Meryt I just realized why she was always asking Egleic if he made fire! I can’t believe it just hit me until now. Me too. I wish we knew her better. Or for a Sela prologue. Did Sela like Egelric or have a crush on him at this point? Or was she more excited by the novelty of talking to a human man? I thought it was both. Hmm yeah I think it was both. Ok… The first time I read it as pure connection between them. On second read with time/​info, I feel much more cynical – I’m tempted to swing 180 the opposite direction. So “reality” is probably in the middle. There is definitely a connection there between Sela and Egelric. She was drawn to him, he saved her life. Egelric was tall, kind of strapping, and brave. He was also human, which made him exotic (or different) and more attractive to her. I think she felt that there was something about him that set him apart from all the other males she encountered.